Although there are high-resolution TVs available, it would still be nice if a console gamer gets a screen that is specially made for such gaming systems. Asus is a brand that you can trust when its comes to gaming. They’ve recently introduced their new product: the Asus VG245H. Even though this monitor is billed a display for console gamers, this particular product also has the AMD Freesync functionality which eliminates screen tears. Is the Asus VG245H a good monitor for console gaming? Read on to find out. The Asus VG245H is a 24-inch TN monitor with a maximum refresh rate of 75Hz and a fast response time of 1ms. Ghosting and blurriness will never be an issue when you’re using this particular gaming monitor. Its aesthetics is pretty simple but what makes it stand out is the included stand. This monitor comes with a square stand and a hole in the middle that allows for better cable management. A common issue for most console gamers is the myriad of cables they have to deal with. Fortunately, that is mitigated when you use this monitor thanks to its included cable management system. Another great feature of the stand is that allows you to tilt, swivel, and adjust the height of the monitor. The stand is capable of adjusting the height up to 130mm. The stand also allows you to tilt or swivel the monitor up to 90 degrees as well. For comfortable gaming, you can tilt the monitor forward and backward. You can tilt the monitor forward up to 5 degrees, and you can also tilt it backward up to a maximum of 33 degrees for maximum viewing comfort. On the leftmost portion of the back of the monitor is a 5-way OSD joystick that allows you to seamlessly navigate through the different OSD menus and its settings. I love this implementation considering that tinkering with the display’s settings can be problematic when using the physical buttons. Most console gamers play in the living room, and their TV displays are usually mounted on the wall. Well, that wouldn’t be a problem as the Asus VG245H can also be wall mounted with a compatible VESA wall mount. This monitor has dimensions of 561x 489x 211mm (including the stand). It also weighs 5.1 kg which is similar to other 24-inch monitors on the market. Overall, the design of the product is simple, and it dons a predominantly black exterior. The VG245H also comes with two, 2-watt speakers. It is nice to have them there, but its sound quality is pretty basic. I still recommend you use either a pair of headphones or a dedicated sound system. The Asus VG245H sports a 24-inch TN panel display with a native resolution of 1920×1080 (1080p). Its full HD resolution is pretty much okay for most console games. 1080p seems to be the standard when it comes to gaming; not only for consoles but also for the PC as well. Since this monitor uses a TN panel, the colors are okay but not that spectacular, at least, when compared to a monitor with an IPS panel. It has a maximum brightness level of 250 nits, and it has Asus’ ASCR (which stands for Asus Smart Contrast Ratio) at 10,000,000:1. For a TN panel monitor, the contrast is pretty good, and the brightness of the monitor far exceeds the minimum requirement of 120 nits. It is not too bright which is good as prolonged exposure to too much brightness can be detrimental to the eyes of the gamer. If you are gaming in the living room, there are chances that glare can penetrate through your windows and might come in contact with the monitor. Fortunately, the Asus VG245H is fitted with an anti-glare screen that ensures that glare wouldn’t be a problem when you’re gaming. Since this monitor only uses a TN panel, it suffers from the same issues like narrow viewing angles and poor color accuracy. According to the specifications, the product only has a 72% color saturation. Despite its lower value, the monitor does perform really well, especially when you’re cycling through the different preset game visual modes. These game modes will change the color temperature of the screen as well as set your brightness, contrast, and saturation depending on the genre of games you’re playing. For example, if you’re playing FPS games, the FPS mode should be used. The FPS mode, improves visibility in dark areas to allow you to score the kill when you’re enemies are hiding in the dark. In RTS/RPG mode, the sharpness and the color saturation of the display are enhanced to give you crisper graphics as such games offer immersive gaming environments that require much attention to detail. There are plenty of game visual modes, and it is pretty subjective. For the most part, you would want to choose either of the gaming-specific modes mentioned above. For all other purposes, the sRGB is a great game visual mode (although, you can use this technically for anything; like web browsing, viewing photos, etc.In terms of) to choose. gaming performance, the Asus VG245H breezes through thanks to its 1ms response time and 75Hz refresh rate. The fast response times of this monitor makes sure that ghosting will never occur. Ghosting is a term used when you see blurry images trailing behind a moving image on the screen. Because it only has a 1ms GTG response time, it is quick enough to change to another color resulting in a much smoother frame. Couple that with a high refresh rate and you will find that the display on the screen is as fluid as can be. Now, for console gamers, because of the limitations of current generation game consoles, having more than a 60Hz monitor doesn’t really make much of a difference. In other words, having a refresh rate of, say, 75Hz when playing console games will not be really noticeable. However, take note that this monitor has the AMD Freesync technology, which means that Asus not only intends this monitor to be used for console gaming but they also intend the people to use this monitor for PC gaming as well. The AMD Freesync technology is an adaptive Vsync technology that makes sure that screen tearing will never occur. When using a compatible AMD graphics card, the feature will tell your graphics card to render the frames only when the monitor is ready to display it. Thus, screen tearing is eliminated without the high input lag that you would normally experience with the conventional double-buffer Vsync. Now, most AMD Freesync monitors use the DisplayPort connection to avail of the feature, but AMD incorporated the “Freesync technology over HDMI” so that this monitor can support the said feature. Enabling the feature is easy as all you have to do is download and install the latest AMD drivers and then enabling the feature from the video card’s control panel. You can experience the full 75Hz experience when using this monitor for PC gaming. Also, the full HD resolution should be enough for most gaming scenarios. Do note that the Asus VG245H uses a TN panel display, so color isn’t really its strongest point. However, the monitor is pretty fast thanks to its impressive refresh rate and response times. The Preset game visual modes also make this monitor’s display better. Just use the one that you like the most. Just remember that there are game modes that don’t allow you to tweak certain display parameters. For example, if you’re using the FPS mode, you cannot change the brightness and contrast of the display. Apart from the aforementioned features, Asus also implements their “Game fast Input Technology” which basically eliminates Input Lag. Normally, signals from your controllers or gaming peripherals are quick, but since most game consoles sport wireless controllers now, it can present a problem known as Input lag. Although there are a lot of factors that define Input lag, having weak signals from your game controllers is just one of the factors that can affect Input Lag. You see, Input lag is the delay between your peripheral’s actions and the time it takes for that certain action to be seen on screen. The Game fast technology ensures that you will never experience input lag even though weakening signals can be a culprit of it. This is thanks to the TN panel, which is a display panel that is known for its optimal speed in gaming. Asus also includes some welcome additions for gamers. For one, this monitor has Asus’ Eye Care technology which basically includes a flicker-free module and a low blue light filter. The former essentially eliminates screen flicker that can be damaging to the eyes and the latter presents gamers with up to four blue light filters that can help protect their eyes from eyestrain due to prolonged exposure to the monitor (which is the case since most console gamers are usually on a gaming marathon session). Another awesome set of goodies is Asus’ exclusive Game plus Technology which is a collection of tools that help improve your gameplay. This feature includes a static crosshair that stays in the middle of the screen at all times (plus, it also comes in 4 designs you can choose from), a handy timer that gives you an advantage in certain games that require precise timings, an FPS counter which gives you the number of frames that’s currently displayed on the screen, and it also has the display alignment tool that makes sure that what you see on screen is on point with the monitor. The Asus VG245H was intended for console gamers, but this monitor can also be used for PC gaming. It comes with two HDMI ports, a D-Sub/VGA port, a 3.5mm headphone jack, and a line-in jack for your external speakers. The company is nice enough to include both HDMI and VGA cables, although I highly recommend that you only use the former since it offers much more visual clarity and resolution than the latter cable. Furthermore, the Freesync functionality only works if you use one of the HDMI ports on display. Since this monitor has two HDMI ports, you are given the flexibility to plug in two HDMI-compatible devices. You can plug your game console in one port and plug your computer in the other port if you so desire. 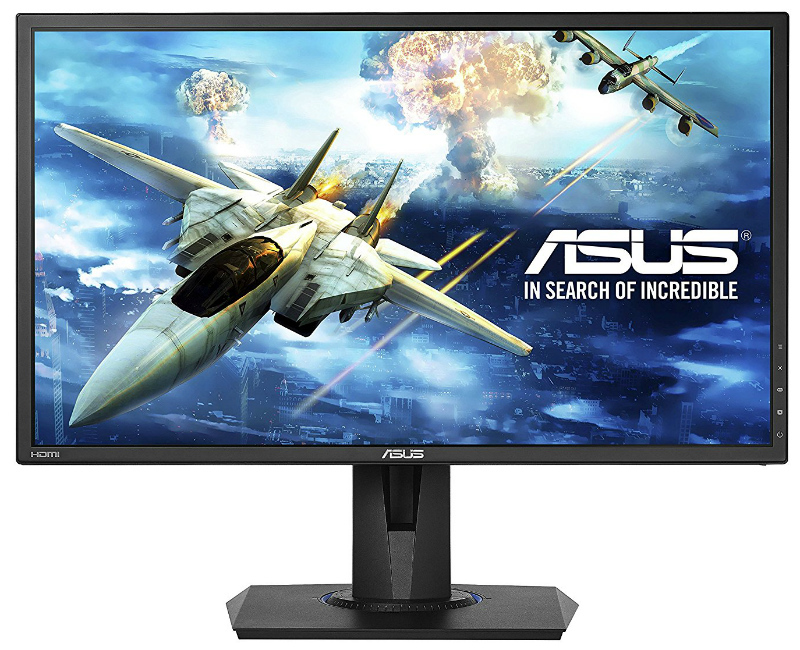 The Asus VG245H is a very good gaming monitor at a sub $200 price point. This gaming monitor is suitable for both console and PC gamers. Because of the display panel used, the Asus VG245H is capable of delivering a high 75Hz refresh rate and it also has an impressive 1ms response time. Add to that the company’s “Game fast” technology, and you will have a smooth gaming experience. With a 1080p resolution, it should make both console and PC gamers happy. It is nice to see the AMD Freesync functionality in this monitor. Most of the monitors that have this technology are priced over $200 that is why I consider this product a steal since it has it. Furthermore, you also get a bevy of features including the Game plus technology, Eye Care technology, two HDMI ports, a monitor stand that has a cable management system and a host of ergonomic features, and much more. Despite its poor color accuracy at 72%, its speed and responsiveness are what makes this monitor enticing. And, at a price of only $169.99, you really cannot complain given the features that this monitor has. If you are looking for a decent gaming monitor that can be used for console or PC gaming, the Asus VG245H is definitely a monitor that you should consider buying. Hello, Clint! No, the Asus VG245H is a 1080p or Full HD gaming monitor. If you are looking for a 4K console monitor, you may consult this guide. Cheers! Hey, If I were to use that monitor for PC gaming and wanted the full ’75hz freesync’ deal, what kind of HDMI cable would I need? Does it come with the monitor itself? Hi, Bob! Thank you for reading our review. Yes, HDMI can handle the full spec of this monitor, but to be sure, get a version 1.3 to 2.0 cable. Also, check your GPU’s HDMI port version and match everything. As for the inclusions in the package, that varies from region to region, so it would be best to assume Asus did not include one in the VG245H’s package since this is a budget-oriented product.